The student organization ONE at GRU won a recent campus challenge from their national organization, hosting a legislative event and documentary screening. Chapter founder and president, Joshua Ibarra, from Evans, Ga., majors in political science with a secondary education certificate. He said the event and the organization give students an opportunity to get involved in something impactful, meet others passionate about social change, and impact social and political culture. As part of the national campus challenge, the organization hosted an event that capped off a four-week campaign to raise awareness of the injustice of extreme poverty, and attracted about 50 attendees. Congressman John Barrow spoke on how constituents influence policy-making, and the organization then screened the short documentary “Protest to Progress,” which detailed the role that music has played in social change. In all, the team generated more than 250 advocacy actions in support of global smart development programs. Ibarra said he got involved in the organization because of his experiences with mission trips with his church, The Sanctuary, in Evans. “I was on an internship with Clubhouse Guatemala for five weeks, working with people in extreme poverty – people living in shacks made of sheet metal with dirt floors. It was crazy. When I found out that ONE worked on alleviating this stuff, it really caught my attention,” Ibarra said. Chapter vice-president, Kaylee Key, from Hephzibah, Ga., is a political science major. She joined the organization in part because of a power outage at her home. After Ibarra presented information about the organization’s work with the Electrify Africa bill before Congress, she went home to a failed power lined. It illustrated for her how basic a need electricity is, and sparked her to attend a meeting. The chapter’s current project is the Electric for Africa bill, HR-2548, which is expected to provide electricity to 50 million people in sub-Saharan Africa by 2020, if it passes. “There are many issues in America but that doesn’t excuse us from paying attention to global issues. Investing in an electrical infrastructure and sustainable development in Africa will allow these countries to develop. This will decrease violence, increase stability, and create future trading partners for the U.S.,” Ibarra said. ONE at GRU meets on Mondays at 1 p.m. 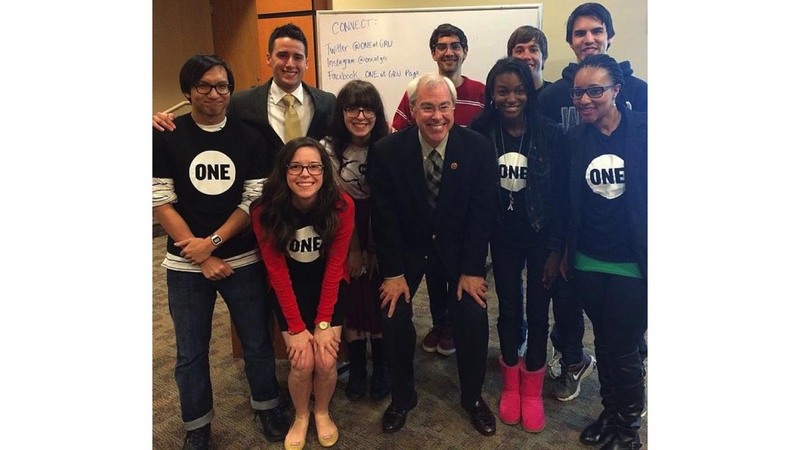 The student group is a campus chapter of the ONE Campaign, an advocacy organization of more than 3.5 million people taking action to end extreme poverty and preventable disease. Visit facebook.com/pages/ONE-at-GRU/447397388709498.